he first course in Greece is being planned for late summer 2017. The first course will be 6 days long, with later courses increasing in duration. 1. What really is The Regeneration Effect within and how do we practice it in our busy daily lives? 2. Does the natural self-healing tendency of the body include and utilize the power of the mind to attune to healing resonances from the Higher Realm? 3. How does mental attuning to Higher Realm healing resonances (perceived as precise sensations within the confines of the body) impact the natural self-healing tendencies of the body? That is to say, does it excite regenerative healing, miraculous healing, or both or none of the above? 4. How is PsychoneurosomaticsTM optimally practiced? The Greek Golden Age brought forth a new science of the mind that fully integrated rational thought and reasoning with spiritual principles of ethics and moral conduct. Additionally for the most adept, the Golden Age explored precise mental disciplines enabling the mind to discern reality as it truly is and to by-pass or be wary of mental practices which may lead to false interpretations of reality as it truly is. Plato's Cave Allegory drew wide-sspread attention to shallow exercises of mind perceiving incomplete reality. These new techniques of mind to interpret reality from its smallest substances to its grandest expression opened up new horizons within the ancient Greek spiritual practices. An important core of these ancient evolved Greek spiritual practices eventually helped form the basis to Christianity's approaches to spiritual mind/body healing. These collective mental principles and practices together were no where better emphasized and utlized than in the healing arts, as taught under the Hippocratic Method. 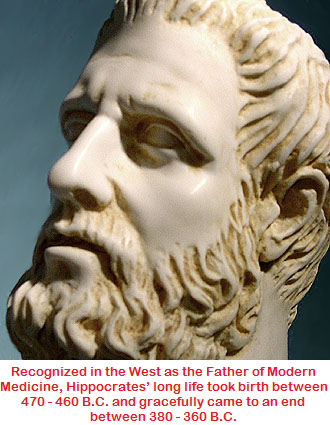 And it all began during the life time of the Father of modern medicine - Hippocrates (circa 460-370 B.C.) - on the island Kos, sitting off to the southeast of Greece proper near present day Turkey. But today this science of the mind has been lost to modern day medical practice. Just as energy interfaces with matter, so does our mind - as waves of energy - interface with the composition of our entire body. Our mind is composed of waves of energy and the body is composed of sub-atomic elements. Both are - at their root - quantum in nature and order. Quantum means the smallest possible discrete unit within energy or matter. At its most elemental unit, where it cannot be further subdivided, a quantum particle of energy or matter loses its anchor to both time or space, making it difficult to access information regarding its true nature and order. Where the two interface with each other is the moment or zone in which the origin and causation to our existence arises. In other words, as the mind makes contact with body, the substance which leads to health or disease arises. And all this takes place in such a rapid paced manner with tiniest substances, that modern science cannot fathom its reality. The mechanics are so quantum in nature that it becomes indeterminant to modern science. Such is the nature of a quantum state generated when our mind collides with our body causing our health or our disease. In plain English, this is to say that the nature and order causing health or disease is not anchored to time or space, nor is it able to be determined with modern scientific methods. It follows then that the nature to or order of health and disease, at its root level, cannot be accurately measured or appraised by modern medical sciences. But since this is our nature, since this is what our mind and boy does non-stop from birth to death, there must be a way to properly discern this. And this is the basis to the ancient Greek science of mind, which culminated in their proverb admonishing us all to - Know Thyself. The Greeks didn't just come up with a clever proverb. They knew from direct experience that by understanding and practicing a special mental science, the adept could fathom their most inner nature and order. At the tip of this process was summoning analogies that enabled insights hidden to the normal eye (see HERE). Again, I refer to Plato's Cave Allegory. But from this tip into the inner nature to and order of reality, special practices of mind could extend much deeper into the mind/body complex (see enkoimisis and endoscopesis below). And physicians who mastered this special science of the mind enabled their patients to undergo healing events of extraordinary measure. This lost medical science of the mind has to do with two key faculties the mind inherently possesses - that is, the faculty of perception and the faculty to feel sensations as they really are. •We can see, hear, touch, smell and taste (things or objects which are components to our external reality), and..
•We can feel, such as pleasant, unpleasant or neutral sensations (which gauges internal body reality). Sensations also arise when we see, or hear, or touch, or smell or taste objects. In fact, it is impossible for mind waves making contact with our body elements not to generate a sensation as a direct result. We commonly assign or attach objects to the sensation after the fact. Plato's Cave Allegory once again comes to mind here. This dependence by modern science to object based analysis should scare the hell out of any scientist in search of fundamental truths about reality as a whole. The science of mind which observes directly sensation arisings, sensation associations and sensation declines come to understand the nature of and the order to sensations underlying causation between the mind and body. In other words, medical science misses a great deal by not utilizing this all-important science of mind. When Einstein (age 16) was attempting to fathom the nature to and order of light waves, he decided to imagine himself riding a wave of light through the Universe. This has been called Einstein's most famous thought experiment. As he road the wave, up and down, twirling around and around, through time and space, his imagined experience later proved the key to discovering his now famous law of special relativity (see more HERE). And we hear of this method time and again being used by many geniuses who discover the next big secret to the Universe. Indeed, sensations go hand and hand with both faculies of mind which accesses both external and internal reality. With proper training, the sensations of the external reality can also be perceived. This gives rise to empathic skills so vital to the eclectic/integrative healing approach embodied by the Hippocratic Method. So, discerning and mastering these two faculties of mind will determine what truths we find. If our medical scientists take only a cursory appraisal of sensations associated with a disease process, or ignore empathic impressions of disease when it occurs within them and when healing arises, they will remain largely blind to the complete causation to the medical mind/body presentation of the patient. In the Hippocratic Method, the patient was likewise guided by their physician to use both mental faculties covered below. This tried and true system helped bring to the surface realizations that proved transformational. That is to say that the realizations transformed the substance of their disease in favor of the patient's natural self-healing tendency (vis medicatrix naturae). This teacher/student mind guiding process brought clarity not only to the causation of the disease, but to the cure as well. But this process needed special facilities to work best. And so the most famous Hippocratic medical sanctuaries (called Asklepieions) utiilzed special sensory deprivation chambers called Abatons. The design of the Abaton was to faciitate the induction of dream-like states in the patients, while the sense doors were placed into quiessence. "With sight concealed the psyche views the body's torments..."
Because such journeys into the nature and order of one's disease or affliction was a profoundly intimate experience, physicians specializing in conducting such therapeutic sessions were cross-trained as priests. This provided a sacred nature to the healing process, one in which it became more readily possible for the sick to completely dive into their inner torments, no matter how grievous or reprehensible the surfacing insights revealed. We have to bear in mind that in those days, many grievous acts of many natures were common place. Horrors were likely to have impacted many lives over the course of their lifetimes. By utilizing the safe, protected, respected and confidential physician/priest to patient relationship, patients could open up themselves to the healing process. On many occassions this led to extraordinary healing events in individuals who had lost an eye or an arm, or who were suffering from incurable conditions. Hippocrates himself was able on occassion to cure the incurable (such as end stage tuberculosis - see HERE) or cure plagues with comprehensive hygienic (sanitary) methods together with medicinal herbs and "valetudinarian" dietetics, as described in his Hippocratic Corpus (e.g., Epidemics I, II, III, IV and VI). The contributors to the Hippocratic Method understood well the Greek dictum, "Physician, heal thyself first, and then you will be able to heal the sick." Emphasis was squarely placed on human or natural etiologies for their disease, as well as for their cure. The victim consciousness that some god or goddess caused their disease was abolished in the Hippocratic Method. But this in no way removed the higher order from participating in the healing process. The higher teachings of the Hippocratic Method fully embraced this and used this by special attuning procedures discussed below. This last aspect of The Hippocratic Medicine is lost to modern medicine. So first and foremost, physicians used their skills on their own mind and body to heal themselves when the opportunity arose. The physician following the Hippocratic Method understood that in order to heal himself, he must know the substance to his inner nature causing the sickness. Only by special practices of both faculties of mind did the physician fully fathom this causal substance within. At the same time when these advanced techniques were being taught and employed, there was loud criticisms to pointless superstitions and baseless techniques which in no way addressed true causation, but used nevertheless by hoards of conjurors (confidence men or con-men), purificators (those that teach performing pointless rituals which do not in fact cleanse the mind or body), and charlatans (idiots) to attempt a healing (see Sacred Disease 1-2, circa 400 B.C. HERE). Some might say after reading at length the sharp criticisms Hippocrates laid out in his treatise Sacred Disease, that he meant to discard spiritual principles altogether in the healing process. In my mind, nothing could be further from the truth. Indeed, what Hippocrates did was to rightfully claim that disease arose due to human factors, and not from being a victim of an angry god or goddess. We sometimes even see this today, asking why God victimized us with this disease or that tradegy. When in truth, God had nothing to do with harming us at all - rather we harmed ourselves via our free agency. What is most clear is that Hippocractes espoused all the greatest spiritual principles as part and parcel to the healing process. He held most high the dictum that, "Above all else do no harm." He emphasized the all-importance of the physician remaining at the bedside to console and support both the patient as well as the family with wisdom and compassion. He would only accept disciplined, determined and energized students who could remain focused, ethical and moral in performing their sacred healing duties. He stressed the all-importance of moral conduct for physicians as well as patients alike. He held that wealth accumulation by the physician was suspect. He held that the search for the truth by proper thinking was the highest commandment of a medical investigator. For only in this manner does wisdom arise into the nature of and order to health and disease. These are all spiritual principles. Some would argue that Hippocrates meant to fashion a healing method that reckoned exclusively with human causations to disease, not divine causations to human disease. I would agree with that, but this is not to say that human causation of disease is not curable by that same human being attuning to proper spiritual guidance and discipline. I say that by placing front and center the human causation to disease instead of an angry god, Hippocrates brought into play sane, rationale and reproducible methodology that could be placed into an art form - the art form of natural healing. Additionally I would say that in this reproducible methodology, patients would oftentimes glean proper spiritual truths (reclaim their true virtue and moral compass) as they confronted life or death events during the course of their disease. And certainly I would say that such spiritual truths gleaned would help free these patients from the debaucherian ignorances rampant in Hippocrates' day. Finally, nowhere have I read that Hippocrates himself denied the existance of supernatural healing forces. What I have read was that Hippocrates wisely pointed out how often the weak minded claimed a supernatural healing took place, when indeed the healing event, though powerful and transformational, could be easily explained by the natural self-healing tendency within. What I have read clearly indicates Hippocrates removed superstition from the Art of Healing process. But no where have I read that Hippocrates removed the spiritual process to the Art of Healing devoted to (i) moral conduct, (ii) discipline to the divine order of healing from within, and (iii) the gleaning of insight into the true nature of our afflictions. B. Those physician/priests who relied upon the lesser skills of superstitious rituals and dogma in the name of the Hippocratic Method. The physician/priests often conducted their investigations and treatments by focusing on the liquids in which the patient was composed of (the fluid in which our cells float). Hippocrates himself refered to this liquid (watery milieu) as the four humors. Hippocrates taught that these four humors would either contain the substances of health, or the substances of disease. In essence, under the Hippocratic Method, the physician/priests only role was to do whatever was necessary to enable the patient's natural self-healing forces within to overcome the substance of disease. In the words of Hippocrates, "Disease [is] not an entity, but a fluctuating condition of the patient's body, a battle between the substance of disease and the natural self-healing tendency of the body." About 2300 years later, this concept became known as the principle of homeostasis, as fully elucidated by the distinguished French physiologist, Claude Bernard. Bernard was also among the first to give all-importance to the understanding of a patients watery milieu in treating disease, in the same manner as did Hippocrates. Now these four humors were said to be respectively dominated by of one of four elements. And these four distinct elements were known as fire, air, water and earth. So, the "substance" of disease or the natural self-healing tendency of the body was envisioned to be actually caused by the character of the four elements. For example, the fire element predominated the course of disease displaying fever as well as cold sweats. This cannot be overstated - the Hippocratic Method envisioned that a mind's contact with body interplayed with four respective elements, and that as a consequence of this contact the substance of: (A) a patient's disease or (B) natural self-healing tendency was determined. What is not generally recognized is that these respective four elements each uniquely possess four unique, distinct sensations. In other words, sensations as part & parcel to the substances or causations to affliction. •Fire element is directly experienced as the sensation of heat or cold (febrile or chillblains also associated with the emotional state identified as choleric). •Water element is directly experienced within as a cohesive binding sensation or a sense fluidity or lack thereof (tension knots or tightness, dryness, edema, excessive fluid production and swellings also associated with the emotional state identified as phlegmatic). •Air element was perceived as vibration or numbness (paresthesia also associated witht the emotonal state identified as sanguine). Furthermore, the ingenious Hippocratic Method held that the substance of disease or natural healing tendency resided in the patient's liquids (watery milieu), which was directly discernable by the respective sensations tied to each element. In other words, the resonance of the sensation was recorded in the patient's watery milieu! And from there, these resonances could either propagate outwards disharmoniously and out of balance into the substance of disease - or when in balance and harmony - galvinize natural self-healing tendencies. Put most succinctly, a healthy person meant their watery milieu was resilient, and in the sick it was in dissaray. In other words, combinations of these sensations were thought to collide to form the overall symptoms of the patient as well as play a role in the disease's true causation. Putting aside for a moment these elements with their respective sensations recorded in the patient's watery milieu, lets just take a look at the watery milieu itself. The great biologist Antoine Béchamp convincingly showed that the water in which cells float determines their underlying morphology (the shape, form, size and structural shifting). For example, cells morph into altered states, such as cell-wall deficient cells, simply by nature of and order to the water in which they float. Toxins in the water altered the nature of the water. And today we know that energetic forces altered the order to the water. Even back in Béchamp's day, two biophysicists were investigating the energetic forces influence upon cells, von Arsdale and Nicola Tesla. Just after their respective work became known, in the 1920's George Crile took this approach using energies to reconstruct living, breathing, reproducing auto-synthetic cells. Today, the work of Robert O. Becker and many others have noted that regenerative frequencies of electrical current may activate adult stem cells to selectively auto-regenerate injured tissues from within (i.e., The Regeneration EffectTM). To me, the cell's watery milieu is the gate keeper to all these beneficial energies interfaces with the cells, tissues and organs. Later, Alexis Carrel gave more definition to this discovery of Béchamp. Sooner or later, the fluid in which cells float, and their respective fluids inside - mingle. This mingling of external and internal waters causes structural and functional changes. Furthermore, long distance communications between the water of similar or unsimilar cells and tissues is conducted through wires systems themselves made of structured water. No blood vessel, no nerve axon, no anatomical structure other than organized crystals of water in the liquid state uniting to form networks to transmit cell to cell, cell to tissue, tissue to organ and organ to body signals. And all these signals are further processed along the way by the neurological system, from the brain on down. To best describe the system of water which conducts signals or energy information, I have brought forth the science of PsychoneurosomaticsTM. Through the Four Pillars which is predominated by PsychoenurosomaticsTM we can now make best use of this science of the cell level on up to bring about rapid, even instantaneous health changes. This form of healing may exceed any kind of known or expected outcome, making it regenerative in nature. And as an extension of regenerative healing, human beings may also encounter miraculous healings. PsychoneurosomaticsTM is the first science to embrace both kinds of rapid healings, rapid healings that might not otherwise occur through normal repair mechanisms. The brain and the rest of the nervous system are constantly translating mind/body communications into structural and functional expressions of our body. But this translation is in turn governed by the fluid in which the nervous system floats. When this is fully understood, it forms a science. And this science of the mind/body is what I call PsychoneurosomaticsTM. But in order to study this science of Psychoneurosomatics, we must leave behind our old habit patterns of mind that would tend to create reality as it would like it to be, rather than as it truly is. And because our senses such as eye sight, hearing, smelling, sense of touch and taste are prone - at deeper levels - to misinterpret reality as it truly is, or to even hallucinate, we must use another part of our mind which does is not limited by our sense door limitations. Unlocking and deciphering the principles of The Regeneration EffectTM requires us to perfect one unique faculty of mind first which accesses bodily sensations for causal analysis. This can only be practiced by suspending (turning off) the sense doors for an appropriate time frame. Non-object based meditation techniques, select praying techniques, certain hypnotic states and guide-driven dream-like states can achieve mental states in which the sense doors become turned off for sufficient time periods to master the faculty. But this practice should only supersede, not replace sense door analysis of objects. The storage center holding onto the resonance (or recording) of both (a) the sensations associated with the event producing the memory, as well as (b) the objects associated with the event producing memory, appears to be within our cellular water. In terms of physics, cellular water acts not unlike a holographic film. With such a holographic film embedded with information of both the resonance of original sensations as well as the objects of the memory, the past blurs with the present. In terms of disease processes, old events can beget current disease, and continually fair the flames of the disease until removed. The ancient Greek physician/priests understood that memory is a process which is ongoing in the present moment, continually impacting that patient's substance (cellular structure, function and signalling system). Detaching from, purifying, or overwriting that memory with another memory unfixates the substance of disease and liberates the natural self-healing tendency of the body. In other words, mental fixations impact the watery milieu to the extent that our cellular structure, tissue function and signalling systems bring on disease. And purifying this watery milieu of the cells, tissues and organs excites the natural self-healing tendency of the body. Put more succinctly, if mind has the ability to make a body sick, then mind has the power to make a body well. The medium for both sides of this mind/body contact is the watery milieu. In essence, now we know that water within our cells forms positively charged layers and negatively charged layers not unlike how a hard disk stores bits of memory as negative charges and neutral charges (1's and 0's). Isn't it amazing how simply storing negative charges and neutral charges can produce beautiful high definition color movies on our computer screen, or exquisite music over our hand-held music player? For all these reasons, it is no wonder that multiple accesses to spring water, water ritual practices, and hydrotherapy all used to purify the body's watery milieu was so integral to therapeutic practices at the Asklepieions. Indeed water appears more able to hold more information than computer hard disks. This is because water stores both positive as well as negative charges in its folds for long time periods. Hard disks only store the absence of a charge, plus a negative charge. Indeed, water may be by far the most superior storage device for all possible wave forms emanating from the past and present mind. In this manner, emotional traumas become stored in the water of our cells and tissues. The watery milieu is actually the substance which leads to knots in our muscles, dysfunction in our organ systems, and low oxygen states in associated regions of tissues. The ancient healers recognized the intimate connection of the watery milieu to nutrients as well as environmental forces. Dietary indiscretions and seasonal changes were thought to impact the influences of the four elements. For example, today we recognize Seasonal Affective Disorder (SAD) as a cause for depression during the winter time. From what I have read, in my humble opinion the Hippocratice Method recognized that these four compounding factors (present mind, past mind, nutriments and environmental forces) impacted the patient's watery milieu to the extent that it governed causation to all health or affliction. And out of these four the greatest weight was assigned to the present and past mind of the patient. From my eclectic studies elsewhere in medicine, I gauge that the mind outweighs the impact of the other two essential compounding factors (nutriture and environmental influences), in a 80% to 20% ratio. For perspective, consider that matter (nutriture and environmental factors) is simply energy slowed down. Furthermore, consider that matter's structure and function is determined by patterns of energy (wave forms) making contact with it. And consider that past and present mind are together simply patterns of waves making impact with body in an ongoing process that does not stop until it is erased or overwritten (the Law of Conservation of Energy and Matter). So for now let us return to the most important two compounding factors, that is, past and present mind. Once we are taught how to discern these two respective faculties of mind, we can access insights into the causation to our present health status. Discerning and then mastering these two different faculties of mind is what PsychoneurosomaticsTM is all about, the all-important fourth pillar to The Regeneratiion EffectTM within. The Abaton was in essence a structure which shielded those inside from sense door distractions from the outside. This facilitated the patient to get in touch with their faculty of mind which feels internal sensations as they are, without distractions. So, in the Abaton the physician/priests were easily able to induce their patients into deep dream-like states while fearlessly and calmly focusing on the associated sensations of their disease. Some patients were fasting to further reduce distractions. With enough time, the patient could begin to observe that it is law of nature that sooner or later the associated sensations to their maladay would waiver, change and eventually exhaust themselves. For example, tension in the upper neck and shoulders can in some circumstance be so severe, that this leads to incessant migraine headaches.The more focused and determined the patient goes face-to-face with the torments, the better the patient observes their arising and falling away. With enough observation, the mind, being occupied with merely observing the torment in a calm state, contributes less and less additional tension into the mix. The old stock pile of tension, not being re-fueled by new tension input, eventually exhausts itself and the migraine disappears forever. A true, psychosomatic cause and cure. In this manner, the constructs (causation) of the disease is seen, and its impermanent nature is understood. The mind's awareness of the body was paramount, and led to indepth discoveries tying sensations to sense door connections (memory or spiritually meaningful images called onar). By flushing out these memories in a special way, or by attaining visions given the utmost spiritual significance to the patient, the mind of the patient found the means to come to terms with their mental torment and cease reacting to it. Another term for this most powerful release of inner torments is now called catharsis. Today we know that the nervous system plays a role of mediation in the psychosomatic process. Plus we know more about the mind itself. Therefore, we now see the causal levels of body health and disease a wave energy processing or energy "flow" between the mind, nervous system and body best described as Psychoneurosomatics. And today we also know that the concept of disease is too shallow in light of Psychoneurosomatics. The watery milieu is involved, which houses a dissaray of information signals best termed affliction or dysponesis. [SEE 'BIBLIOGRAPHICAL TREATISE' HERE CONCERNING DYSPONESIS]. We are now left wondering how affliction or dysponesis can be successfully treated at its causal level with drug therapy? As healers, if we train and perfect ourselves in PsychoneurosomaticsTM, and then introduce this methodology to our patients. we can avoid blind spots in object based diagnostic analysis, and determine real causation of affliction within patients. Psychoneurosomatics is most consistent with the ancient Hippocratic Method and therefore a central tool used in Eclectic Medicine. In summary, PsychoneurosomaticsTM provides physicians the means to diagnose and treat true disease causation. PsychoneurosomaticsTM understands that because sensations are always produced when the mind makes any contact with body, causal events are accessible by guiding the patient into the bodily sensations in a purposeful way. Such purposeful guidance results in patient and physician insights into the causal nature of the affliction. Once insight is achieve, the means to delete or overwrite these causal events becomes available as well. In other words, in ignorance we cause our own affliction. But in wisdom, we liberate ourselves from such ignorance - right down to the cellular level on up! Smashing atoms and other sub-atomic particles to separate out more elemental components within sub-atomic particles tells us little to nothing about how those components are inter-relating with energy and matter in their actual quantum state. We must distort their nature in order to view it with sense door analysis. This method used to ascertain the altered composition of reality only gives us reliable data under the context of what happens under the exact same artificial circumstances - not what actually happens in the Universe at large. Therefore, sense door analysis is akin to Plato's Cave Allegory. That is, our sense doors only gain access to the shadows and echoes of ultimate quantum reality of mind and body. Put another way, sense door based medical analysis can only yield shadows and echoes of the root substances causing health or disease. Platos' greatest student, Aristotle recognized the requirements to properly utilize sense door analysis. As Aristotle's sense door analysis applied to medical analysis, the signs and symptoms found in the physical examination was all-important. But Aristotle also recognized the requirement to properly use non-sense door analaysis to get to the substance of energy and matter, since the sense doors can be easily fooled. In a very real sense, these non-sense door practices were spiritual in nature. Essential spiritual practices for both the physician as well as the patient intrinsic to the Hippocratic Method included strict moral conduct, moderation in food (even fasting as mentioned above), and keeping mental wakefullness at all time. This was a special kind of wakefullness which embraced mental calm and deep dream-like focus within. When this Aristotlean non-sense door method of analysis was applied to medicine, it became known as enkoimisis and endoscopesis. The goal of enkoimisis was to facilitate - under direct supervision - the patient to over time sequentially undergo powerful, transformational realizations or epiphanies by dissecting the associated sensations of their illness. As the sequential process of enkoimisis proceeded, this not only gave back to the patient a sense of control over their torment, but more importantly enabled another phenomena of mind to arise. As layers upon layers of the torment dwindled and dwained and discharged (i.e., true catharsis), this end-goal to realize transformational epiphanies or profound insights closely associated to the causal substance of their illness would reproducibly arise. Under a precise methodology, such healing events often involved spiritual practices and realizations as the physical healing took place. It is recorded, etched into the stone ruins of many of the Asklepieions, that many such spiritual/body realizations boardered on the miraculous. The Hippocratic Method termed this discovery healing process endoscopesis. In the end, by reconciling the two systems of analysis together, the whole patient was treated in the proper context. The disease itself was not treated, rather the substance of disease was transformed into substances causal to the natural self-healing tendency of the body. When this referbishing of the substances causal to the natural self-healing forces of the body was optimal, unexpected and even extraordinary healing events occurred (i.e., The Regeneration EffectTM). These two systems of analysis devised by Aristotle were incorporated into the formal Hippocractic Method at the very end of Hippocrates' life. This mental training of the ancient physician/priests soon dominated the Hippocratic Method until approximately the 5th century A.D. And as legend has it, miraculous healing events intermittantly but persistantly arose out of this healing system. For a complete discussion on this discussion as it related to the proper applications of The Hippocratic Method, please see The Regeneration Effect: A Professional's Guide to Psychoneurosomatics, Volume 2, Part D, due out in early 2017. Students are taught the rest of how all this works in modern day applicatons of PsychoneurosomaticsTM at our trainings listed above on the main tab above. (C) 2012, All Rights Reserved. "The Regeneration Effect", "Psychoneurosomatics", “PNS-VTA”, "cRFs" and the "Regenerative Lifestyles" nameplate are all trademarks of Regenerative Lifestyles, LLC.